Truth by Kbaig: Attack on Karachi Airport! Is There Anyone to Take Responsibility of Negligence? 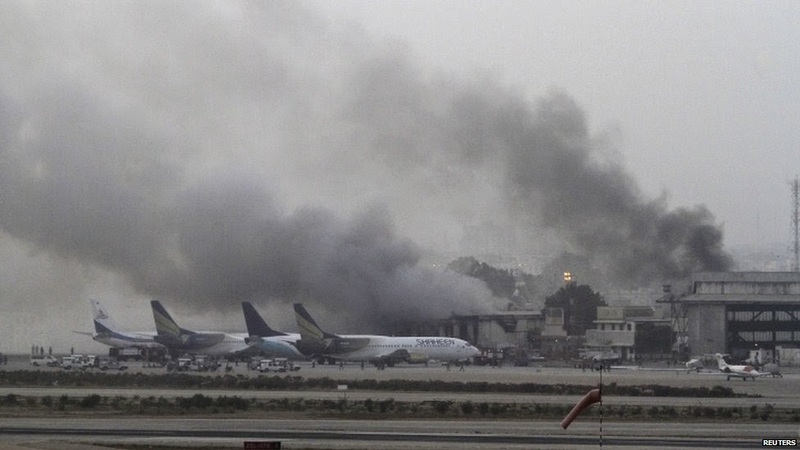 Attack on Karachi Airport! Is There Anyone to Take Responsibility of Negligence? After oath taking of Current govt. and change of Chief of Army staff, scenario and situation is changing rapidly. On the one hand there are mega projects for which Pakistan has been forced into the international debs; on the other hand the relaxations for powerful mafia & business community and after looking at the activities of the political elite it can be easily predicted that despite of imposition of uncountable taxes, nation will not be able to get out of these debts for next half century. Because on the one hand whole burden has been shifted to middle class and poor in the form of indirect taxes, on the other hand ruling class is busy in extravagancy at the expense national treasury. Increasing prices and unemployment had resulted in increase in crimes against common man because Police protection and Private Security guards are only within the reach of the elite class. On the other hand govt. had increased the prices of necessities to such an extent that they have become out of reach of the masses. Yes! Few families are minting money by day and night or perhaps with every passing second but there number out 200 million will be 0.2 to 0.4 million. Rest of the public is just “Alive”; neither rulers nor elite are concerned about the suffering of the public. A change in the war against terrorism on the internal level was observed when new Army Chief warned terrorists that terrorism would not be tolerated anymore and this warning was realized when in reaction of a terrorist act, jets of Pakistan Air Force destroyed hideouts of terrorists. Newly elected govt. that was willing to resolve the problem of terrorism through negotiations wasted so much time in start of the talks that defense analysts termed these negotiations not only as fruitless but also an attempt to give time to terrorists to reorganize and re-strengthen themselves. With the passage of time the stance of these analysts proved to be true; on the one hand terrorists were carrying out suicide bomb blasts and on the other hand govt. was claiming that negotiations are the only way towards peace. “Pakistan’s Taliban known as TTP are facing major army offensive against the wishes of PM Nawaz Sharif . TTP (Tehreek Taliban Pakistan) enjoyed Nawaz’s protection under the banner of peace negotiations to buy time. But the army decided the time was up and launched a major offensive against TTP in North Waziristan on North Border. Geo the TV Network what supports TTP and Nawaz’s peace talks, offered two of its news executives to represent Taliban in peace negotiations and to be in negotiations”. Western intellectuals do not consider propaganda of Geo against intelligence agencies and armed forces just a personal clash but they are viewing it through a different angle. However, in spite of apparent apologies Geo TV has not stopped its propaganda for a moment and after prolonging the dispute for undue time, on the day Geo TV was banned by PEMRA for 15 days and fined Rs 10 million (which is nothing more than the insult of defense departments) on the same day Geo TV served a notice to Defense Ministry and ISI either to apologize or pay Rs 50 billion within 14 days. 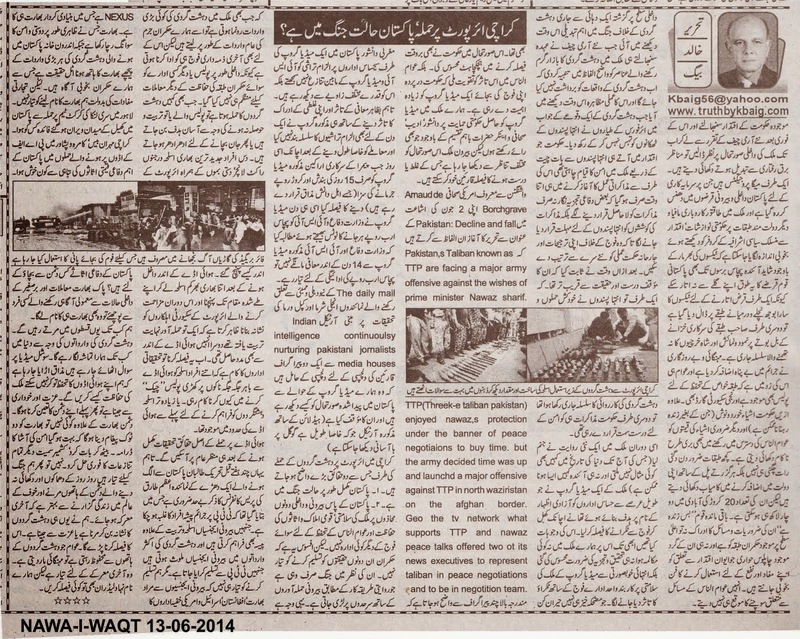 “The Daily Mail's investigations indicate that Jang Group was trapped by RAW long ago. However, after the launch of media house's TV Channel, Geo TV, RAW's interest in this Pakistani media house grew to new extent. Geo TV was launched just a year or so before RAW launched its hostile covert war in Balochistan. With the mushroom growth of TV Channels across Pakistan, many of which are still surviving merely on shady foreign funding, Geo TV could not attain the expected revenues or one can say that the lust for more and more revenue generation eventually landed Geo to a stage where it started looking forward to means of foreign funding through one project or the other, without disclosing it to the public or the government. It appears in the beginning, Geo TV administration got closer to the Indians to get benefitted from the experience of the relatively established TV media in the regions but eventually the media house landed deep into the sinister plans of RAW. The picture in this direction started to get clear visibility when after the infamous 2008 Mumbai attacks of 26/11, Jang-Geo group took a globally unprecedented turn and instead of defending national interests and instead of confronting Indian government and Indian media's anti-Pakistan propaganda campaigns, it toed the line of the Indians and tried its best to portray that Mumbai terror attacks were originated from Pakistan and indirectly pointed the finger towards Pakistan's top security agency the ISI. The Daily Mail's investigations indicate that Indians have always been very active in nurturing and trapping individual journalists as well the media organizations to run certain covert operations against Pakistan. Sometimes the journalists willingly offered their services in this direction and in other cases some journalists unknowingly and rather innocently served the purposes of RAW. 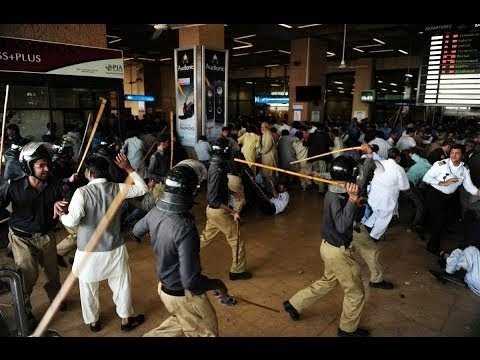 After terrorists attack over Karachi Airport two bitter realities become clear, 1) Pakistan is completely in war; 2) Pakistan has no other force or department to defend herself from internal or external threats to her integrity. Irony of the fate is that our rulers are not ready to accept both of these facts. According to them war is that which is fought only on the borders against foreign invaders. That is why whenever any tragic incident of terrorism occurs our rulers take it as a normal crime but for this only army had to face the culprits because internally police or any other department had not been organized or trained for such encounters besides protocol duties of political elite. Whenever Police had to face such a terrorist attack they either become easy target due to lack of training or run away from the spot to save their lives. 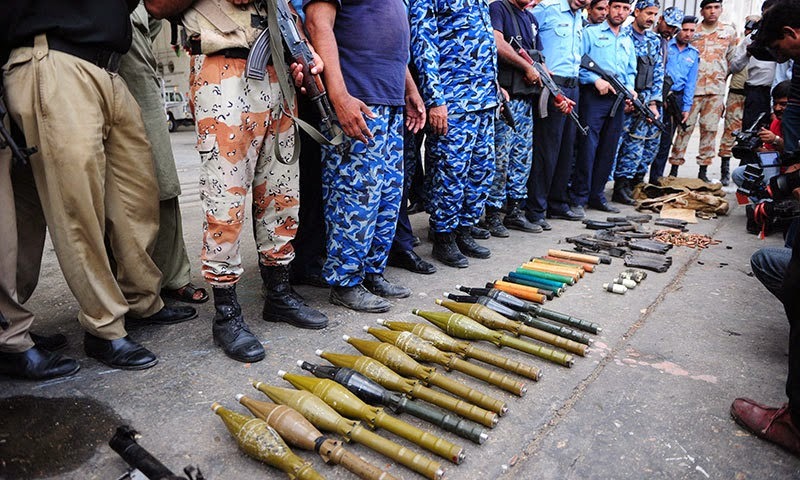 How is it possible that 10 persons along with heavy weapons, dozens of grenades, rocket launchers etc. entered into the airport unchecked? Entering into the airport with such a heavy gear, reaching their specified targets and targeting resisting security personnel shows that terrorists were not only well trained but they had support from within the airport. Now this is a question that needs to be answered by investigations agencies that how 10 person succeeded in passing through police check posts along with such heavy weapons or the weapons were already dumped within the airport for the terrorists? 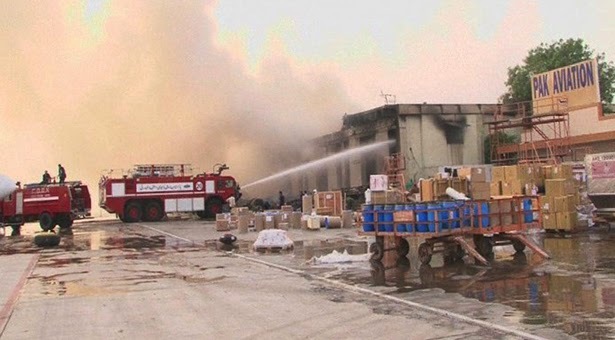 The facts regarding attack over airport would come into light after completion of investigations however, I would like to mention the press conference by Azam Tariq, representative of a group of TTP who has recently left TTP in which he says that TTP had been over ruled by criminals who are being trained and funded by foreign agencies along with supply of weapons but we are not ready to accept this reality that foreign agencies mean nexus of intelligence agencies of Afghanistan, India, Israel and USA in which pivotal role is being played by India. India! Which is apparently staging the drama of peace and friendship but in fact Indian involvement in any major terrorist attack is a bitter reality which is well known by our rulers but are criminally silent for their trade interests. 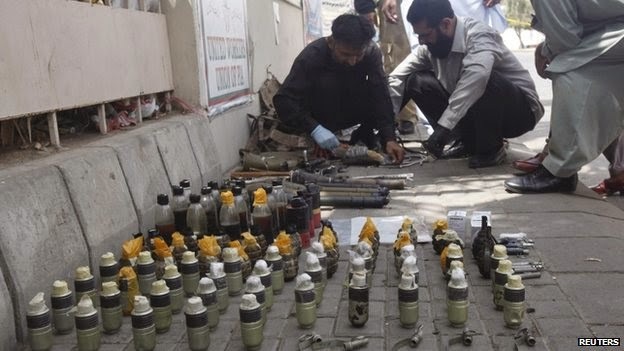 Attack over Sri Lankan team in Lahore resulted in closure of Pakistani Cricket Stadiums, who benefitted from this, attack over Karachi Mehran Base, Kamra and Peshawar PAF air bases who was behind them; Pakistan has all these defense assets for defense from who, anyone whom has a little know how about sub-continent would answer “India”. How long would we die in parts, how long would we be target of terrorism, on social media we are being insulted that one who cannot defend their airports how will they defend their country? If we have to live with respect than we will have to identify and define our enemy. There is no enemy except India so we will have to give a clear message to the enemy, enough of the AMAN KI ASHA drama; sit down, negotiate on Kashmir and all other disputes and resolve them. Otherwise we are already facing deaths in terrorist attacks; in spite of living such a life of cowards covered with the fear it is better to have a last war. Whether we have to die in the hands of terrorists or live a respectful life; we will have to decide now. Public that survives terrorism is killed by increasing pries is ready for the final war but our so called representative and leaders will also have to decide now!! !